Strawberry nutrition (PDF) - UC Extensionist Mark Bolda's presentation on strawberry plant nutrient make up, fertility needs, nutrient assimilation, and potential nutrient-related issues. Pest Discussion-Spider Mites (PDF) - Characterizes the common strawberry insect pest spider mites and describes challenges in and strategies for their management. Neoseiulus fallacis-dispersal and biological control of tetranyalus urticae following minimal inoculations in strawberry field (PDF) - Article describing Neoseiulus fallacis (predatory mites) as a biological control method for spider mites on strawberry plants. 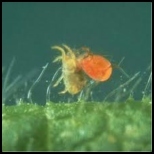 Spider Mite Predator (PDF) - Factsheet explaining how methods for using Neoseiulus fallacis as a biological control method for spider mites on strawberry plants. Verticillium Wilt of Strawberries (PDF) - Contains images and information to assist in identification, prevention and treatment of verticillium wilt in strawberries. Pudricion carbonesa en la fresa (Spanish) (PDF) - Contiene imagenes y información para ayudar in la identificación, prevención, y manejo de pudrición carbonesa en la fresa. Charcoal Rot of Strawberry (PDF) - Contains images and information to assist in the identification, prevention, and treatment of charcoal rot of strawberries. Recent Developments on Strawberry Plant Collapse Problems in California caused by fusarium and macrophomina (PDF) - Article discussing the history, detection, and treatment of strawberry fungal pathogens Fusarium and Macrophomina. Status of Macrophomina phaseolina on strawberry in California and preliminary characterization of the pathogen (PDF) - Article providing insights on the susceptibility of strawberry plants to fungal pathogen Macrophomina. Strawberry Integrated Pest Management (Website Page) - Resource from UCANR providing strategies for year-round integrated pest management in strawberries.